We have a nice little group of horses here whose names all begin with S and they are headed by Saffy. Her breeding is Cob with a good dash of Clydesdale and she is what’s known as a Blagdon Cob. That means she has a lot of white in her genes. This appears in her showy white markings and her unusual spring ‘in between’ coat, which is almost strawberry roan with lots of white hairs. When she loses that her summer coat is a rich bay, like Lola and Benson. I find quite a lot of my horses through friends and Saffy is one of them. 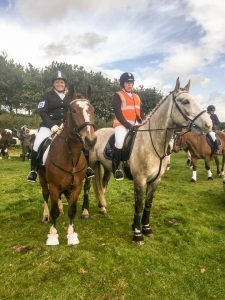 One of my retired ponies, Millie, had gone to a lovely family home where she was having lots of fun with the daughter, Lauren. They had a very nice young mare that they had bought as a baby and shown very successfully in hand. She had been professionally broken, then turned away to grow and mature but when she came back into work she was a little too feisty for Lauren. They were very sad to make the decision to sell and their priority was a good home where they could keep track of her. That was where I entered the picture. I went to visit my old friend Millie and at the same time I took a look at Saffy. I found her to be a little tense and wary but she was very responsive to my natural horsemanship. Within ten minutes I had achieved join up and I believed my approach would be ideal for her. Her family were sad to see her go but were sure the trekking centre was the right home. I immediately began training her. Jake had arrived at almost the same time and having the two newbies together helped them to settle in. They are still best friends. 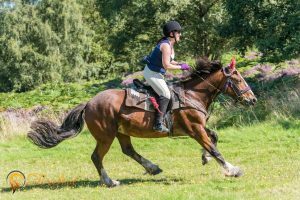 Saffy learned really quickly and was soon being ridden out on the Chase, which she loved – and still does! 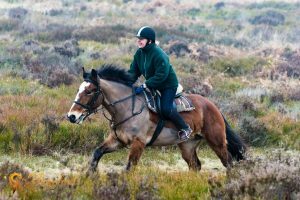 She was not used to living with a large group of horses and at first didn’t like having them around her on the treks, but she soon got over that and has gone from strength to strength. 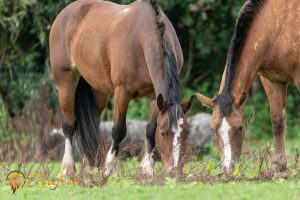 Our yard manager Sonia has trained her as her guide horse and the two of them have a very close relationship. Sonia says Saffy is afraid of nothing, describing her as one of the most honest and genuine horses she has ridden. Saffy has done beach rides and the Sheriffs’ rides and is now working well in the arena too. She is one of our most comfortable horses to ride and has a lovely nature. She is very happy here and her old family still come to visit.